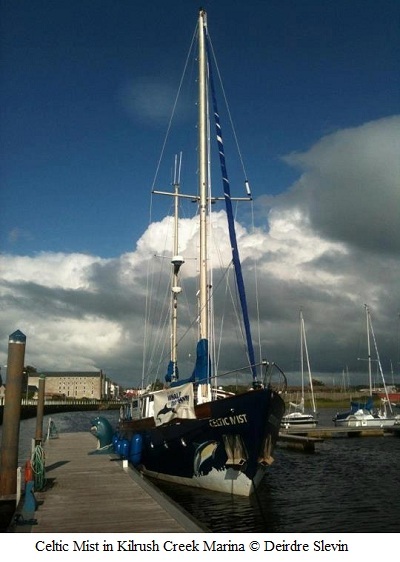 In March 2011, the family of the late Charles J. Haughey made a very generous offer to the Irish Whale and Dolphin Group, in the form of a steel hulled 56ft yacht with six berths in four Cabins called Celtic Mist. This gift was in recognition of Mr. Haughey’s lifelong love for the sea and respect for the work of the IWDG. On the 7th June 1991 Charles J. Haughey officially declared Irish Waters a Whale and Dolphin Sanctuary. After much consideration and a range of commissioned surveys, IWDG Director Fiacc O ‘Brolchain and a team of volunteers thoroughly inspected the yacht which was lying in the Isle of Wight in England and recommended that the IWDG accept the offer. 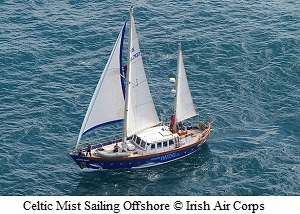 Skipper Fiacc O ‘Brolchain travelled over to the Isle of Wight with his crew and sailed Celtic Mist back to Ireland. 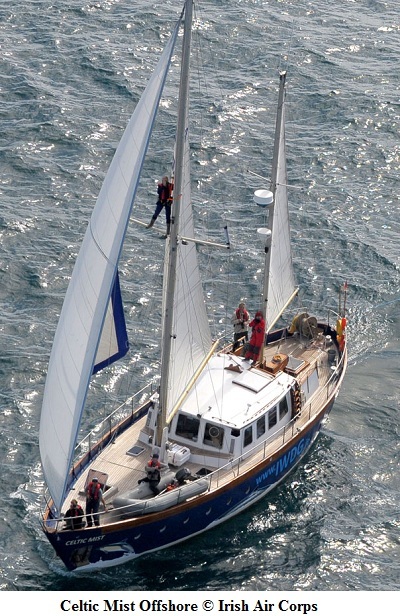 On arrival in Waterford, the vessel joined the Tall Ships Race 2011 from Waterford to Greenock. 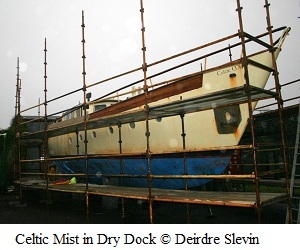 Celtic Mist is a fantastic resource for all IWDG members. IWDG intend to use Celtic Mist to train and teach IWDG members how to survey and record whales and dolphins, including using acoustic survey techniques. It will also be used for dedicated research projects and professional training and development. Now the IWDG have their own research vessel, what are our immediate plans for its future? We prepared a Business Plan to support our grant application to Clare Local Development Company where we are intending to make the vessel self-financing within three years. This will be achieved through a combination of members week-long cruises, day trips, dedicated research surveys and training courses. We are presently preparing a Cruise Schedule for 2013 which will include six one week long cruises available to IWDG members in the first year. These cruises will run about every three weeks from May to September. Each cruise will depart on a Sunday and finish on a Saturday and require a skipper, chief scientist and six crew. These cruises will enable IWDG members to learn how to carry out marine surveys including acoustic surveys, how to log effort and to identify and record cetaceans and other marine megafauna, including photo-identification which is an important tool in the study of whales and dolphins. There are also plans for another shelf edge cruise in September following the success of RV Celtic Mist first cruise this year when 11 species were recorded, including blue whales, in less than a week. RV Celtic Mist will be used to promote marine awareness and education. We have been invited to marine days in Fenit, Co Kerry, Sixmilebridge, Co Clare, Culdaff, Co Donegal and Derry for the City of Culture. It might be difficult to accept all invitations but it is good publicity for the IWDG and interest in whales and dolphins in Ireland. We will be carrying an educational tour in May/June 2013 along a stretch of the coast (route yet to be decided) following funding from the Irish Environmental Network. We hope other Irish NGOs with a common interest in the marine will join us on this tour. We also intend delivering training courses onboard RV Celtic Mist and the vessel will be available for private charter and to all IWDG members with ideas for the vessel. This boat belongs to all IWDG members and we are looking forward to ideas, proposals and input from you all.